What is the best method of storing turnips and rutabagas? Turnips and rutabagas are often confused with one another. If you have trouble telling the difference, these tips may help. Turnips have white skin and purplish top. It is sometimes called white turnip. Rutabagas have a thin, pale yellow skin with smooth, waxy leaves. 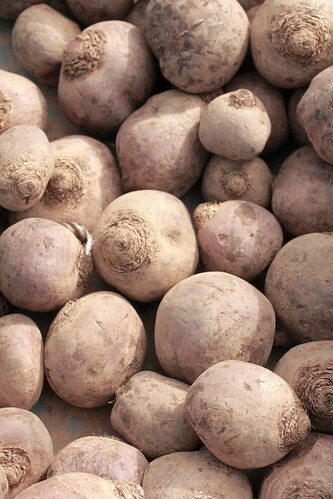 Rutabagas can be called everything from “yellow turnip” to “swede” to “neep”. It is also sometimes even referred to as just a “turnip”. If you happen to have turnips or rutabagas with the tops still attached, they can be stored in a cold (32°F or 0°C) humid environment. They need to be stored on shelves or in baskets so that there is good air circulation around them. These turnips can be stored for 4 to 6 months. Turnips and rutabagas with the tops removed can be stored in the refrigerator. Often stores will sell rutabagas that have been coated with wax. This is done to prevent moisture loss. If they are not coated with wax, wrap them tightly in plastic. If you found this post useful, or if you have any tips for storing rutabagas or turnips, please leave a comment.